PESHAWAR, Pakistan A car bomb tore through a crowded bazaar outside an office for anti-Taliban tribal elders Saturday in northwestern Pakistan, killing at least 17 people, officials said. The blast in the town of Darra Adam Khel was the latest to strike the troubled area near the Afghan border, showing militants still pose a threat to the stability of key U.S. ally Pakistan despite government offensives against the Taliban and their supporters. 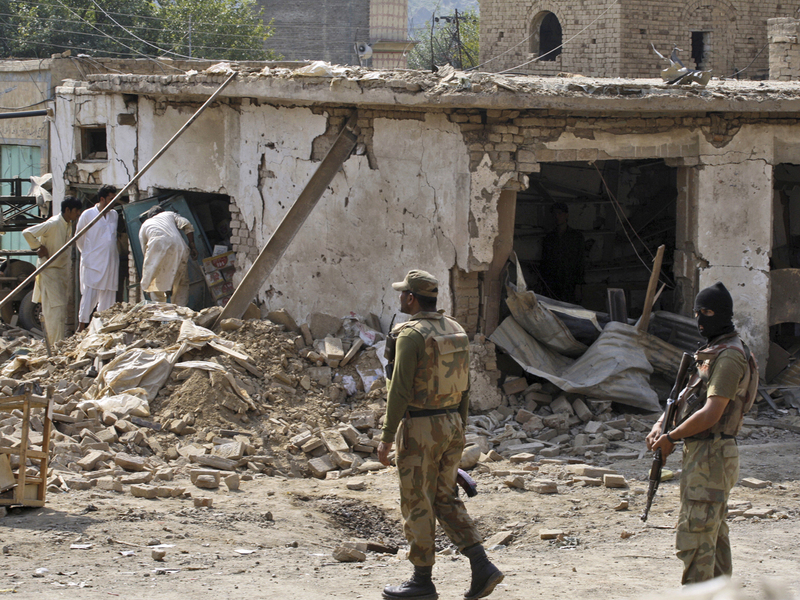 No group immediately claimed responsibility, but the Pakistani Taliban have staged similar attacks in the tribal region of Darra Adam Khel to punish elders for backing security forces in offensives against militants. The explosives-laden car was parked near the office of one of the so-called peace committees that have been formed by local elders trying to rid the area of militants, regional government administrator Fakhruddin Khan said. It was unclear how many people were in the office at the time, but Khan said those killed included tribal elders and passers-by. He said 40 people also were wounded and the attack destroyed 35 shops and eight vehicles. The dead and wounded, including some in critical condition, had been transported to hospitals in the northwestern city of Peshawar. The region, which is in the Khyber Pakhtunkhwa province, is famous for its weapons market selling guns made by local craftsmen. Provincial Information Minister Mian Iftikhar Hussain blamed the Pakistani Taliban, noting the fundamentalist Islamic movement also had tried to kill a 14-year-old girl who is an advocate of education for girls and a critic of the Taliban. Malala Yousufzai was shot and wounded by a Taliban gunman in the Swat Valley on Tuesday, an attack that has drawn widespread condemnation. The girl remains on a ventilator but is in stable condition, army spokesman Maj. Gen. Asim Saleem Bajwa told reporters Saturday. She had been airlifted from Swat to a military hospital in the frontier city of Peshawar after the attack, where doctors removed a bullet from her neck. The bullet went into her head before travelling toward her spine. Bajwa said earlier that it was too soon to say whether she had a significant head injury. After her sedatives were reduced on Saturday, she moved her arms and legs. Bajwa said it was a good sign. The school that Yousufzai was attending in Swat's main town of Mingora  which is run by her father  reopened for classes Saturday. About 80 percent of the students showed up, but many were sad and scared, said one of the teachers, Asghar Khan. "We want them to concentrate on their studies without any fear or psychological impact from the attack," said Khan. Some 500 tribal elders held a rally in support of Yousufzai in Mingora on Saturday. Some carried photos of the 14-year-old and two other girls who were shot in the attack. They shouted, "Malala, we are all with you." Hussain, the provincial information minister, urged the federal government to consider launching a "decisive operation against terrorists" to eliminate the militants. "These Taliban have killed our innocent people in so many attacks. They are still killing our people. Instead of wasting time, we should hit them back, and we should do it as early as possible to save the precious lives of our innocent girls like Malala Yousufzai," he told reporters in Peshawar. South Bend Mayor Pete Buttigieg’s decision to run for president was a surprise when he first mentioned it to his husband. The Afghanistan War veteran would be the first openly gay nominee of a major presidential party. He would also be the youngest person ever to become president. John Dickerson spoke with Buttigieg and his husband, Chasten, about the campaign in an interview for "CBS Sunday Morning." Watch the full interview Sunday, April 21. Democrats in Congress are debating how to pick up Robert Mueller's Russia investigation where he left off. Democratic Rep. Jerrold Nadler, chairman of the House Judiciary Committee, joins "CBS This Morning" to discuss his plans to subpoena the full Mueller report and why he doesn't think Attorney General William Barr is doing his job properly.